This is not A Tale of Two Cities but it is a tale of two political universes. 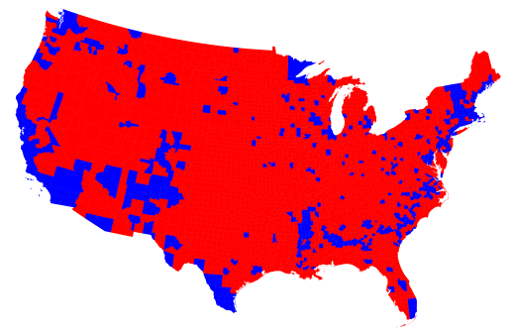 President Obama may claim that there’s not a “red America or blue America,” but we’ve all seen the maps, and it’s obvious that in many parts of the country we’re looking at bright red states and deep blue cities. Navigating this tricky terrain will take all of the political agility we reformers can muster. 1. We need Democrats. It has become fashionable by some on the right to write off the left as far as school choice is concerned. With such GOP dominance at the state level, and now in Washington, who needs Democrats? Beyond the measly four states with complete Democratic control, that is. To be sure, in many red states, charter supporters don’t need Democratic votes in the statehouse in order to get bills passed and budgets enacted. But we do need the support—or at least the benign neglect—of big-city mayors and other municipal officials if charters are to live up to their potential. Charters in most cities still struggle to find affordable, suitable facilities; there are still endless nagging problems around transportation and other “support services”; common enrollment systems are a boon to parental choice but can’t happen without district consent. On all of these issues, we’re better off with supportive leaders than without them—and those leaders are almost all Democrats. 2. We need Republicans. This should be obvious, especially considering the national and state election results. Yet it feels to me as if many of reformers on the left have spent the last year denying this reality, pushing the reform movement to embrace what they call “social justice” and what I would view as hard-left positions on race, criminal justice, and more. To the extent that these reformers were trying to gain credibility on the Democratic side of the aisle, I get it—but you cannot continue to antagonize mainstream Republicans (by, for example, constantly calling them racists just because they don’t agree with you on issues of race) and expect them to continue to champion our cause. And as a matter of basic arithmetic, the charter movement cannot survive today without GOP support. There just aren’t enough Democrats for Education Reform willing to buck the unions. We’ve all seen what’s happened in Boston, home to the best charter sector in the country. Charter supporters threw a Hail Mary pass in the form of a ballot initiative; the reason they had to take such extreme measures was because the teachers have had the legislature in a head lock for a decade. A Republican Senate in Massachusetts would go a long way (as it has in deep-blue New York). 3. The best charter policy tends to be bipartisan. For those of us who are as committed to charter quality as to quantity, it’s pretty obvious that bipartisan politics tend to produce better policy. States with overwhelming Republican control—think Michigan—tend not to do enough to ensure strong charter oversight and adequate funding. States under iron-fisted Democratic control, meanwhile, don’t allow charters to expand at all, or micromanage them into conformity and mediocrity. But “just right” policies—strong accountability, lots of operational autonomy, fair funding, no micromanaging—tend to be embraced by charter school realists in the center of the political spectrum. When you look at smart charter policies in Colorado, New York, Louisiana, Tennessee, and elsewhere, you tend to see the fingerprints of mainstream Republicans and reform-minded Democrats—the folks with lots of influence when government is closely divided. Despite the rhetoric of it being the “civil rights movement of our time,” education reform has in fact been a centrist project for at least twenty-five years. It needs to stay that way if it’s going to live for twenty-five more. Let’s try to remember that in coming days, when we will all be tempted to head to the barricades, to fight the “other side” in various battles to come. If only for the kids, let’s keep the friendly fire to a minimum.